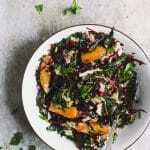 Inspired by, my Herby Summer Kale Salad. Wash, dry and remove the center ribs from the kale. Shred it finely. In a large mixing bowl combine the kale with 1 tablespoon olive oil, 1 tablespoon lemon juice and a pinch of salt. Massage it with your hands for 1 - 2 minutes or until the kale is bright green and pliable. Add in the cabbage, beets, scallions and parsley and toss well. Next add in the oranges and pomegranate seeds. In a small bowl whisk together the remaining olive oil, lemon juice, apple cider vinegar, a pinch of salt and pepper. Then drizzle the dressing over the salad. If you don't have oranges on hand, any winter citrus would work. Clementines, mandarins, grapefruits and/or tangerines would also be delicious.